Now that we’ve briefly detourned into the spectral world, let’s get back to the RPG books that shaped (warped) my view of gaming and its possibilities. 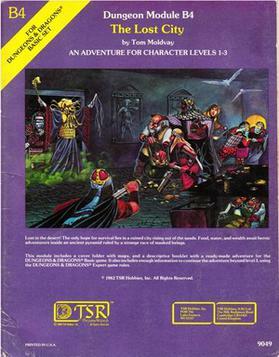 There are only a few books I recall the immediate moments of purchase, but are quite so vivid as when I purchased “The Lost City” (aka Dungeons and Dragons module B4). It was the summer of 1983, as I recall, and my family was visiting my grandparents in Minnesota. We went for a walk to the nearby shopping plaze (really not much more than a grocery store and a few shops) where at what I recall was a drug store, I spotted his beauty on the shelf. I’d gotten the Red Box for Christmas and was slowly building on my supply of books… I think I owned the basic rules, the AD&D monster manual (itself a somewhat confusion revelation) and Keep on the Borderland (B2) but not much more than that. B4 is the pulpiest sort of scenario- heroes taking refuge from a sand storm in a forbidding ruin only to discover the entry way to a lost civilization- but when you are nine you’re not jaded or picky. I remember racing back to my grandparent’s apartment, peeling off the plastic wrap, and being totally enraptured with what I found within… masked societies, ancient tombs, traps… it was an imagination bomb in my mind. Best of all (though I was very unhappy with this at the time) the lower levels of the dungeon were left unmapped! I had to make it up for myself, damn you Tom Moldvay (save of course for some nifty notes about what was generally to be found below including a whole city in a cavern, a forest of fungus, and, of course, Zargon. What is Zargon, dear reader? He was THE beastie, the Big Bad, the Monstra Ex Dungeona, the big, tentacular cheese. He wasn’t the greatest monster in the history of AD&D, let alone in the pantheon of great nasties, but he was my first tentacular, semi-alien monstrosity. While he bears more than a little similarity to the “Kraken” from 1982’s Clash of the Titans, I still think of him as my first taste of the (vaguely) Cthulhu Mythos. Zargon will see you now. The weird cults that sprung up around the cult of Zargon, all in a drug-induced haze, wearing animal masks were also fascinating. I also found the back story embedded into various locations – murals of the fall of the city, the treasures and tombs of the now-deceased leaders – gave the whole place a depth far in excess of any dungeon that had come before (admittedly there weren’t that many, but hey). Finally, I think it important to say a few words about Tom Moldvay. Like too many of the leading lights of Dungeons and Dragons, he died too soon and mostly forgotten. From what I understand he lived alone in a small apartment in Akron. I met him once, thought as a 12 year old I didn’t connect his name to his books. At best, I fear I annoyed the hell out of him (and everyone else at the RPGA table). If you are interested, check out his bibliography and remember.